St. Martin's Press, 9781250151650, 352pp. Warm sun, cool drink, and nowhere to be—that’s Margaritaville! It’s a celebration of relaxation and an invitation to enjoy good food and good company. Margaritaville: The Cookbook is filled with recipes that bring the flavor of island living and the spirit of Jimmy Buffett's iconic song straight into your home. Margaritaville isn’t confined to single spot on the map -- the recipes draw inspiration from around the world, from Jerk Chicken to Tuna Poke with Plantain Chips and Jimmy’s Jammin’ Jambalaya. And we've got you all covered, from family-friendly Aloha Hotdogs to drool-worthy Vegetarian Burgers. It's 5 o'clock somewhere and no vacation is complete without a cocktail—preferably a margarita, of course! 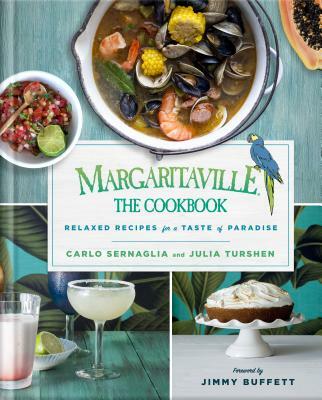 Margaritaville: The Cookbook is loaded with drink recipes to inspire your blissful island cocktail hour—from Jimmy's Perfect Margarita and Paradise Palomas to Cajun Bloody Mary's and the quintessential Key West Coconut and Lime Frozen Margarita. Chef CARLO SERNAGLIA is Margaritaville’s great catch. With his law degree in one hand and a Lionfish spear in the other, Chef Carlo chose to follow his heart to the ocean and to the kitchen. Carlo’s passion for cooking led him through Italy, Venezuela and Florida before arriving on the shores of Margaritaville. Now as the brand’s Concept Chef, Carlo brings his appetite for fresh ingredients, bold flavors and memorable meals to Margaritaville recipes, menus and guests. Julia Turshen is the author of Feed the Resistance and Small Victories, named one of the Best Cookbooks of Fall 2016 by The New York Times. She has written for Vogue, Bon Appétit, Food & Wine, Saveur, SELF, The Washington Post, T Magazine and The Wall Street Journal. She lives in the Hudson Valley with her wife, dogs, and cat.